The author of The Money Workbook, Dr. Roger Bruce Lane, is a graduate of the Wharton School of Finance and Commerce of Pennsylvania University. Lane has a created a training program titled the "Money Workshop". The exercises from The money workbook contain some of the exercises from that workshop. 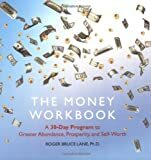 The money book contains an Introduction, 30 days of exercises, an Afterword, and a section that gives information on the author's books, workshops, DVDs and other services. The book discusses more than just financial know-how; it also explores the "concepts of lack and limitation, self-worth and acceptance, giving and receiving, and...self-love" (p. xi). One of the book's main premises is that we create our own reality -- we alone determine whether we have a positive or negative attitude throughout our life experiences. The author writes, "We create the world according to what we focus upon; where we place our 'attention' determines our direction" (p. 6). The book is divided into 30 days, or exercises. Day 1 is titled "The Check Exercise". This exercise consists of a blank check printed on the page. The reader is instructed to make out the check in any amount, payable from the reader to himself. On Day 2, "About That Check You Just Wrote", the reader is asked how he felt about writing this check. Space is provided below for the reader to write in their answer. The author's instructions then state, "Now fill in how much you are willing to give yourself" (p. 4). On Day 5, "Identifying and Acceptance Exercises", there are two parts to the exercise: A and B. In Part A, the reader is asked to write down the thing that he judges the most about himself. In Part B, the reader is then asked to complete a sentence starting with "I accept" based on the information he gave in Part A. The reader is then instructed to "write the sentence ten times in your best penmanship" on the workbook page (p. 15). On Day 13, titled "The Snap Exercise", the reader is asked to "think of something or a situation that you have been creating negatively in your life" (p. 46). The reader is then instructed to snap his fingers or clap his hands and "think, see, feel, and hear this same situation", except in a positive reframe. Then the reader is asked to complete the following sentences: "An area of my life with which I am not happy with is" and "The positive value of being happy in this area is". The day's activity concludes with "Now make it okay inside yourself to have this in your life" (p. 46). On Day 18, the exercise is titled "The Giving-and-Receiving Exercise". The reader is asked to make a list of three things in his life that he has denied himself, for whatever reason. The author then instructs the reader, "Now pick one of the three that would strain you monetarily and psychologically, and go out and give it to yourself" (p. 66). The activity ends with the word "Now!" in a larger, bold font. The exercise on Day 26, titled "'My Momma Done Told Me' ", discusses how a reader's values have been learned from previous generations. The author states that some of these values may no longer be applicable in the reader's current life. The author writes, "When we live values and practices and beliefs that are our parents' and grandparents' we are not living our beliefs but are acting out of habit" (p. 98). The reader is instructed to write down how each of his parents felt about money. The author states that the reader can write about any primary person in his life -- not necessarily his own mother or father. The money workbook is a useful tool for clients needing to practice mindfulness and increase insight into their relationship with money. While quite a few of the exercises do not discuss money directly, they do still impact the client's life and his acquirement of wealth, both monetarily and spiritually. Dr. Stephanie Sarkis is the author of three books: 10 Simple Solutions to Adult ADD: How to Overcome Chronic Distraction & Accomplish Your Goals (2006); Making the Grade with ADD: A Student's Guide to Succeeding in College with Attention Deficit Disorder (2008); and ADD and Your Money: A Guide to Personal Finance for Adults with Attention Deficit Disorder (2009). Dr. Sarkis is an Adjunct Assistant Professor at Florida Atlantic University in Boca Raton, Florida. She is also a National Certified Counselor (NCC) and Licensed Mental Health Counselor (LMHC) based in Boca Raton, Florida. She provides counseling and coaching to children and adults with ADHD/ADD. Her website is www.stephaniesarkis.com.